The modern messenger bag dates back to the transportation of pretty much everything, used by everyone from the Pony Express to foot messengers stomping the stones of Ancient Rome. The style — which affords easy access to the bag’s interior — was later embraced in the 1980s by urban bike curriers, but has since transcended any sort of niche to become one of the bona fide options for any sort of professional, with styles that vary from weather-resistant bags to hand-tooled leather designs that cost a pretty penny. When deciding which one is the right bag for your business needs, take into account how you’re going to use it — cycle commuters will need something more robust and likely larger than someone who travels a few blocks from public transport to office door. Also, consider what you want to carry; some come with integrated laptop sleeves and all the pockets you’d ever need, while others are basically big buckets of simple, weather-proof storage. And be sure to gauge the level of professionalism that you want to convey, as today’s designs vary from the very traditional to bold, bright patterns and colors. With so much to mull over, we rounded up the best messenger bags to buy today, so you can arrive at work and get right to it. Australia-based Crumpler has been making some of the best — and brightest — messenger bags for decades, and the Chronicler Plus is no exception, save that it comes in two office-friendly color options, black or navy blue, rather than their typical explosion of color. This cavernous pack carries more than 18 liters, and accommodates a 15-inch laptop, along with six internal compartments, and a zippered front pocket on the flap. Behind the flap, another zippered section has slots for notebooks, phones, pens and the 1,001 other modern-day business essentials. And Crumpler’s love of bold fabrics — integrated here in the inner lining — offers a pop of color that also brightens the inside, making it easier to find what you need. The main compartment is secured with both Velcro and twin buckles, and the durable fabric and reinforced lower section makes it near impervious to bad weather. You can stabilize heavy hauls with the removable “leg” strap, which lets you secure the pack if you're cycling, while the adjustable shoulder strap has integrated padding to lessen the load. 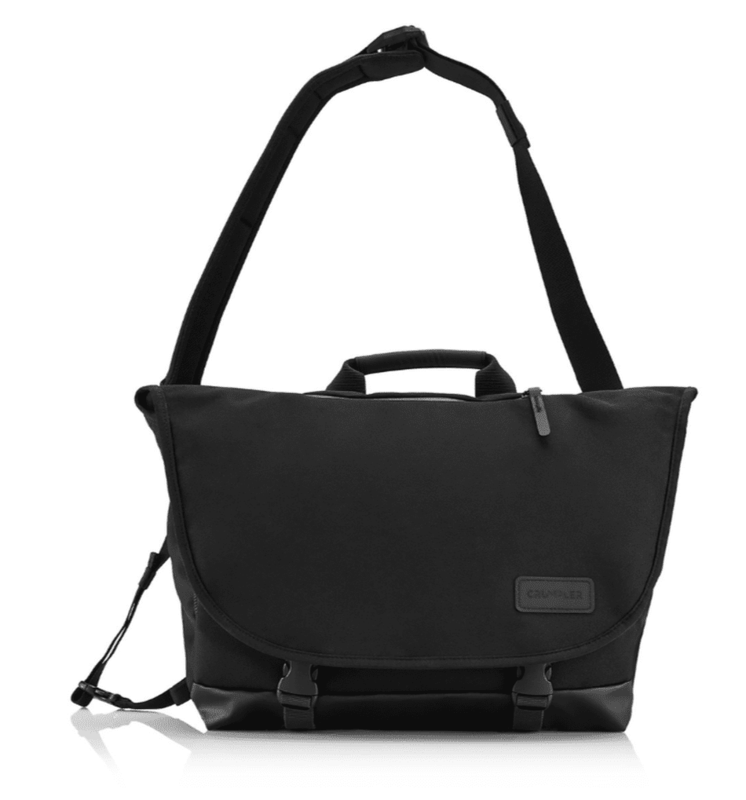 If all that space is overkill, you can always downgrade to its cousin bag, the 11.6-liter Chronicle bag, which comes with an external 13-inch laptop sleeve. From Chrome Industries’ bold winged lion logo to its now-iconic seatbelt strap, the Citizen reigns as one of the simplest, most reliable messenger bags on the market — with good reason. The cavernous 26-liter main pocket doesn’t include a padded laptop sleeve, but it can accommodate a 17-inch laptop, and you get a few organizing pockets in the front. But while it lacks a few OCD-level organizational features, you do get a fully weatherproof pack thanks to the 18-ounce waterproof truck tarp inner liner, which is suspended from the seams of the 1,000-denier Cordura outer shell, meaning water won’t even penetrate through the seams. The flap secures with two buckles and a large Velcro pane, and the strap (made of seatbelt webbing and secured with a quick-release seatbelt buckle/bottle opener) adjusts easily​ and includes an EVA shoulder pad, along with a cross-chest load stabilizer. Touches of reflective elements on the secondary straps also add a degree of safety for the bike commuter. Dubbed a messenger bag/briefcase hybrid, the Proof marries a professional aesthetic with Timbuk2’s reputation for making bomber courier bags. The rugged waxed canvas exterior shrugs off foul weather, and the leather trim and heavy-duty zippers add a bit of sartorial flair and additional protection. The padded laptop sleeve can accommodate a 13-inch MacBook and internal organization comes with spots for your pens, phone and other must-have essentials, along with another internal zippered pocket that stretches the length of the pack and two smaller pockets on the front. The padded back and back-panel zipper flesh out the cycle-friendly features, and the cross-body stabilizing strap can be removed when you’re not on the bike or carrying heavier loads. This one doesn’t come with all the bells and whistles you’ll find on other bags, and it won’t keep your kit dry if your commute includes crossing a raging river, but when comes to hitting the sweet spot — in terms of price, aesthetic and performance — the Waxwear Field Messenger Bag nails it. And it does so because it keeps things simple. A neoprene sleeve accommodates a 13-inch laptop, the angled shoulder strap is comfortable and easy to adjust, the checkerboard poly lining keeps things sleek and plush and leather handles and reinforcements at the bottom help reinforce the weather-resistant waxed cotton, which is sourced from the historic Scotland’s Hally Stevenson Mill. The main flap is secured by snaps. You also get a zippered pocket under the flap, a few stash sleeves inside, as well as a hidden magnetic back pocket. What you don’t get, however, is loads of storage. This one is for someone who already carries a dedicated gym bag and doesn’t need space for a big water bottle. The Monty’s dominant feature is the weather-proof, roll-top main compartment, which can be used in either the traditional flap-top mode, secured by twin buckles or by rolling down the lid and Velcro’ing it in place when the weather gets really foul. Inside, you’ll find 1,300 cubic inches of storage, along with two quick-access Velcro cargo pockets and a zipper pocket that stretches the length of the pack and sits above those two pockets — with another zippered compartment inside. The bag has no padded laptop sleeve, but can fit a 15-inch computer in the main pouch, as well as a 13-inch laptop in the zippered compartment, and boasts high walls on the side to really lock out the elements. Made of bomber 100D nylon — one of the most durable fabrics in the world — it has a refreshingly subdued, almost weathered appearance, with a solid shoulder strap bike commuters will appreciate, as well as a detachable cross-chest stabilizing strap. One caveat: the Velcro securing the two small compartments can be jarringly loud, which is great to keep the rain at bay, but might be a bit much if you’re trying to quietly grab your cell. If your work includes lots of travel, you’ll appreciate the checkpoint-friendly configuration of the Covertabrief, which includes a padded 17-inch laptop pocket that’s TSA-approved to stay in the bag. You also get…pretty much everything else, too, including a back slip panel to attach your bag to the handle of your rolling suitcase, puncture-resistant lockable zippers, loads of easy-grip handles and all sorts of internal organization (a padded electronics pocket, a pen slot and key fob and a cord winder). You can even pull out the concealed backpack straps and hoist it on both shoulders. The water-repellent fabric shrugs off most weather, save the occasional monsoon. It only comes in the rather modest “asphalt black,” and while it probably won’t win any design awards, its overall utility makes it stand out in a crowded field. Detroit-based Shinola started with watches, and they bring the same attention to precision-crafting all the right details with their leather products. Witness the E/W Messenger, which leans into a heritage aesthetic while also integrating a few 21st-century touches. Outside it follows tradition — high-quality leather (in three shades, including black, brown and fetching bourbon), along with a flap top, a silver-tone zippered compartment on the back, and adjustable webbing strap for over-the-shoulder or across-the-chest convenience. Inside, the cotton-lined bag includes a hanging canvas pocket, a key fob, three open pockets, a card pocket and enough space to comfortably fit a 15-inch laptop. At $795, it ain’t cheap — but the leather exterior should develop a beautiful patina over years of use, and the craftsmanship should make it last for decades. Filson has been in the bag business since 1897, and have built their reputation by using only the highest-quality bridal leather sourced in North America and tanned in the United States, along with solid brass for the two-way zippers and other hardware. The look of the Padded Laptop Bag is timeless — and will last a lifetime. It’s made from Filson’s signature Rugged Twill, an industrial grade fabric that fights off water and wear, along with an adjustable leather shoulder strap for cross-body carrying and an additional storm flap with a snap closure for added protection against the elements. Pockets abound — four stow pockets, as well as a zippered pocket, three internal dividers, five additional utility pockets and space for a 15-inch laptop padded with dense foam. But the entire bag itself is well-padded at the sides and bottom, lined with cotton canvas, to keep everything you’re hauling safe, stylish and easy to access.